Hey! I’m Anne Mauney, fellow intuitive eating Registered Dietitian, blogger at fANNEtastic food, and one of Alex’s co-creators of Joyful Eating, Nourished Life, our new 6 week virtual intuitive and mindful eating group program. As part of the program, we spend a week on falling in love with exercise – which we prefer to call movement – and finding a fitness routine that you actually enjoy rather than dread. I’m popping in today to share a little preview and some of my best tips for loving fitness. When we were kids, moving our body was one of life’s greatest joys. I remember my happiest days were those spent playing in the pool or running around the woods with friends. One of the best nights ever, in fact, was a lock-in at my gymnastics studio where we spent literally ALL night bouncing around on trampolines. I was so exhausted and happy by the time my mom came and picked me up! But when I got older, exercise suddenly started to feel like a chore. What had changed? Over the years, thanks to diet messaging, movement has become something that we associate with calorie burn and appearance rather than joy. It was another job and another thing to try to cross off the endless to do list. One of the best ways to make exercise fun again is to change our mindset about it. Try to uncouple the idea that exercise is for calorie burn, and instead view it as your happy “me time” to destress. Focus on moving simply because it feels good, and because you can, rather than because you HAVE to. The next time you have a workout coming up, instead of dreading it, think about how nice it will be to have some time to yourself. Going into a workout with a happy mindset will make a surprising difference in how your workout goes (and whether you stick with it in the long term or not). And when you are finished, focus not on that calorie burn, but rather on how the workout felt, and how good it feels to have moved. Be proud of what your body accomplished! This sounds like a no brainer, but for #1 to work, finding a form of exercise that you actually like is key! I’m a big runner, and a lot of my clients will ask me if they should start running. “Only if you actually like it,” I say. Exercise is all about finding what YOU love and have fun with, not what someone else loves. Remember that what works for someone else might not work for you! I have a lot of friends who love certain forms of movement that I don’t enjoy at all, and vice versa. Just like with the work we choose to do or how we spend our free time, each of us has things that we enjoy more than others, so there’s no reason to feel exercise has to be a one size fits all type situation. Try to think about what you enjoy and translate that into some sort of activity. It doesn’t matter what everyone else is doing or what everyone else finds fun. This is just about you. So first, start with what you like. Love team sports, like when you were a kid? Join a local rec league. Huge fan of dance? Try a Zumba or hip hop class. Like being social when you workout? Recruit workout buddies or find them online (MeetUp is a good place to find local workout groups). Love running or biking but only with others? Check your local running/biking store – they usually have free group runs/rides a couple times a week! It may also help to think about what you want to get out of the movement. Do you want some solo time to think? A relaxing yoga class to calm you down? A pumped up exercise class to energize you? Fresh air? Remember that this may change day to day, and that’s okay, too! Be sure to try different variations on the same movements, too, and to give things more than one shot. For example, I hate running on the treadmill and by myself, but discovered that I love running with other people because it turns it into a social outing. Similarly, I originally didn’t like yoga because I had trouble calming my mind – and now it’s become one of my favorite forms of movement. Remember that exercise doesn’t have to be a big formal, structured thing – it can be as simple as taking a quick stroll outside, playing with your kids, walking your dog, or whatever feels good in that moment. Get creative! Also, remember that just because someone else works out a certain amount of days per week doesn’t mean that you have to. Determine what is realistic for you and your schedule and be gentle with yourself if there are days where movement doesn’t happen. Above all – try to find the joy in movement. It feels good to move, but only if we are embracing it simply for that reason and nothing else. What forms of movement do you enjoy? Any other tips for falling in love with movement? Want to learn more about treating your body with kindness and respect and eating and exercising without stress? Check out our intuitive and mindful eating program: Joyful Eating, Nourished Life. Our first group launches June 20 and sign ups are happening now. Space is limited – we hope you will join us! Great tips! I run with some friends and part of the motivation is getting to see and chat to them. If I miss my runs I feel I’m missing them too! Totally agree! 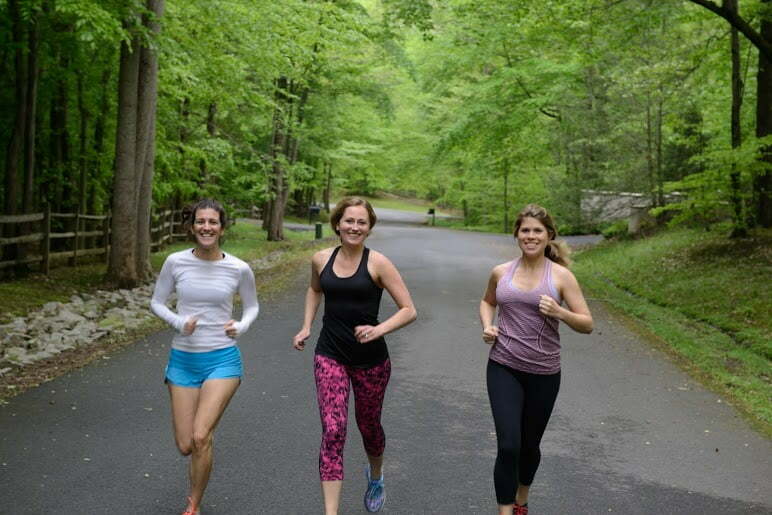 Running with friends is hands down my favorite way to exercise! Great article and tips! I love running by myself. It’s my ‘me time’ but when it comes to yoga I love my chatty little yoga group that meets once or twice a week. Without those ladies I definitely wouldn’t practice! That’s exactly how I feel about my group exercise classes- it’s my “me” time. I actually look forward to them as a break in my day! Thanks for commenting! It’s a great content, it’s very informative and helpful about the fitness trick and tricks. Thanks, Alex for sharing such great post. Running with friends is the most wonderful thing. It adds an extra spark to your regular boring exercise. I am following this since last few days and believe me I look forward every day to meet my friends. Thanks Urvashi! It’s a great way to combine exercise and social activity.